Hi Everyone! 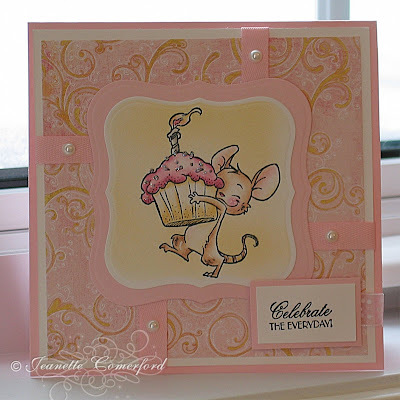 Here is my card for this week's Cute Card Thurday Challenge which is to "have a giggle". This WOJ image from the newly released Party Animals collection just makes me smile every time I see it. That mouse is so cute and he reminds me of my little 3 year old who is always so adorable- especially when he is up to some mischief! I used sketch # SC207 from Splitcoasters and used my favorite embellies: ribbons and pearls. The sentiment is also from WOJ. I used my Copic airbrusher to create the background behind the mouse. Now, I have been using the canned air and am going through it too fast. I am looking into getting an air compressor and would welcome any advice or comment from any of you that already own one! This card is beautiful. I love the colors, the mouse!, and your take on the sketch. TFS!! I would love to help you on the compressor front...but..my Dad sorted out mine..I haven't a clue..just that it's a mini air compressor....i am a bit dence in that department..lol..sorry hun. fabulous card, love the paper, the pretty ribbons and pearls and that image is so sweet! Thank you for joining in the CCT challenge! Truly yummy creation Jeanette! The cute mouse is as big as the cupcake. I know what you mean about kids and mischief, but they are all worth it! this is so cute and I love the soft colors of it!! So pretty Jeanette. Love the soft colours! Jeanette what an adorable mouse! I just got him in the mail and can't wait to make something with him! Love how your layout is! I love this! The image is so cute and you colored it beautifully. Love the colors you chose and the DP! have a lovely day all of you. What cutie... I think you could have also entered your previous card to the 'giggle' challenge... that image made me smile too. This is just soo, so cute!! I love the soft pastels and your coloring is amazing!! I love how you used the air brushing behind the image!! Great job! What a sweet card! I love the papers and the ribbon looks so pretty! Love the image as well! Very sophisticated looking card! And the most beautifull colour :) That background paper looks so great and goes so well with everything else. I got through the cans too quickly too! What an adorable card! Just love the colors and the mouse is so cute! So happy and upbeat!